When I make an elegant dinner roast, or Sunday Dinner Roast like my prime rib recipe I also make along side a Yorkshire pudding recipe that makes the occasion seem extra special. It’s a seasoned perfectly with spices and the drippings of the roast Ive cooked made into individual bread buddings to serve on top of the beef roast (or Turkey) for that matter. Any meat you have pan juices from will make a delicious savory side dish. I’ve tried so many recipes from Yorkshire pudding by Gordon Ramsay to Jamie Oliver’s recipe for them. 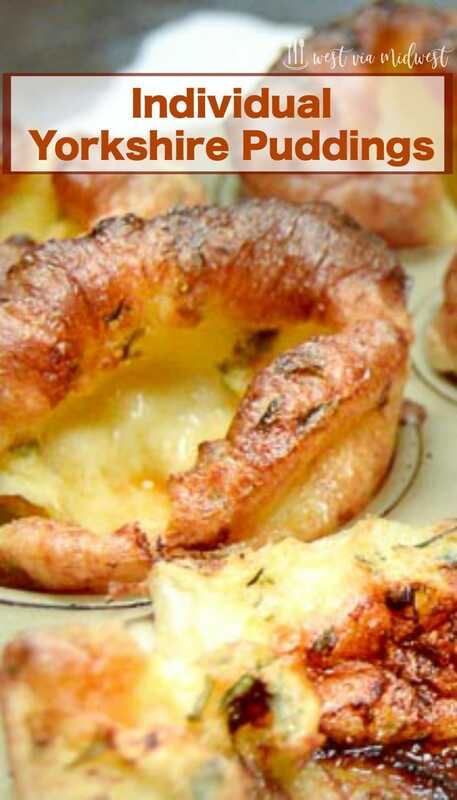 This easy Yorkshire pudding recipe is a mix of about 4 of them I’ve tried. I like the light texture of the ones made with this recipe. A golden brown exterior seasoned with any herbs and spices that I had put on the roasted meat. Yorkshire pudding is an English popover made from eggs, flour and pan drippings most often with a roast beef dish. It’s savory with crispy edges but has a moist flavorful center that is often seasoned with the herbs you have seasoned your meat dish with. They are a type of popover that is made with an egg, milk (or cream) and flour batter with seasonings. They can be made in individual muffin tins or in large rectangular shaped pans. They are baked at a high temp where the edges get crispy and flaky and rise up and pop up super tall and the center remains moist and a savory meat au jus flavored center. Most fancy restaurants such as Lawry’s the Prime Rib and Simpsons in London always serve it with prime rib. Once you’ve had a fresh one you will be wanting them with any meal that has gravy or pan juices! Where did the name Yorkshire pudding come from? Originally Yorkshire pudding was referred to a “dripping pudding.” *see reference below. 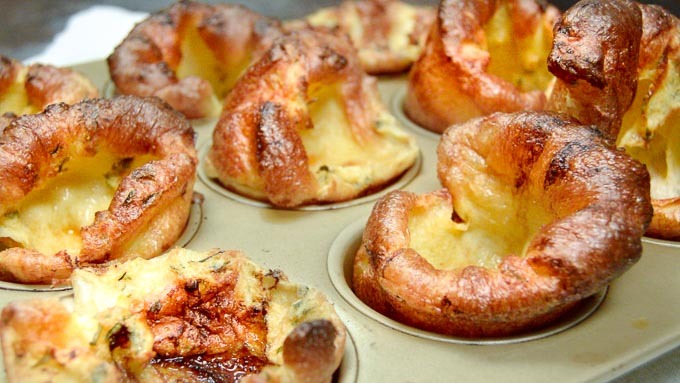 The first time the word Yorkshire was referred to as Yorkshire pudding was in a publication in 1747 by Hannah Glasse. She referred to them as Yorkshire puddings to differentiate from the style of puddings from other areas at the time. While today puddings generally mean sweet treats, in the earlier times they were moist savory breads made at a time when meat was very expensive and the savory bread pudding was served as a way to use every single part of the meat purchased. They were made in the ovens underneath the rack of the roast and the “drippings” would fall as the egg/bread batter was baking giving it wonderful full flavors. They would then be served as an appetizer to stretch the meat flavor over the entire meal. Rest the batter for at least 30 minutes to let the flour “set”. Take the pan drippings from the bottom of the roasting pan from any meat roasted. Using a muffin tin (aka Yorkshire pudding pan) add a tablespoon to the bottom of each tin. Spoon the batter in and fill the tin to 1/2 – 2/3 full. Bake for 13 – 15 minutes until the pudding “pops” as much as it can. Let the batter rest for at least 30 mins after making. This allows the flour to fully incorporate into the liquid. It is very important you heat the pan with the oil to HOT before adding the batter. This allows the edges to start cooking immediately and the edges will get crispy and you wont end up with a soggy, mushy pudding. 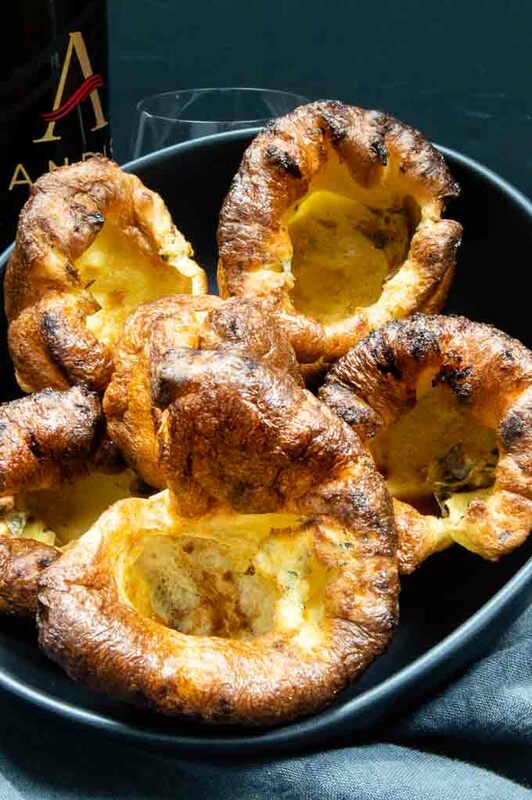 What is the difference between a Yorkshire pudding and a popover? Yorkshire pudding is a type of popover. But if you make it in a muffin tin, (aka Yorkshire pudding tray) it will be a little shorter with less crispy area. A popover pan is smaller at the bottom and tends to be taller. 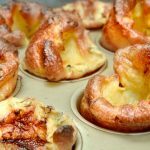 How can I serve my Yorkshire pudding? If you make them individually you can serve them right out of the pan onto your roast beef, turkey, roast pork loin and drizzle au jus or gravy over the top. Can you freeze the batter or the leftovers? I don’t recommend either of those things. The batter mixes up so quickly there is no need to worry about the time. The leftovers will keep a day or two, but freezing them they wont have the same texture when you pull them out and will be a soggy mess. What can I use to make Yorkshire pudding if I don’t have enough drippings leftover? Not to worry, you can use any oil that has a high smoking point like a vegetable oil to make them. If you have any brown bits in the pan scrape them up and put them in the oil for additional flavor! Can I substitute milk or cream in place of half & half? You can use whole milk and it will rise and still be the right texture. I’ve tried substituting heavy cream and they dont rise or have a nice crispy edge texture so I dont recommend using cream for any Yorkshire puddings. ** historical information comes from Historic UK. See their website here for more interesting information! Traditional Yorkshire pudding is a savory "pudding" made with pan drippings for Sunday roasts and for special occasion meals like Prime Rib dinner during the holidays! Crispy popped edges with a soft, flavorful pudding center! 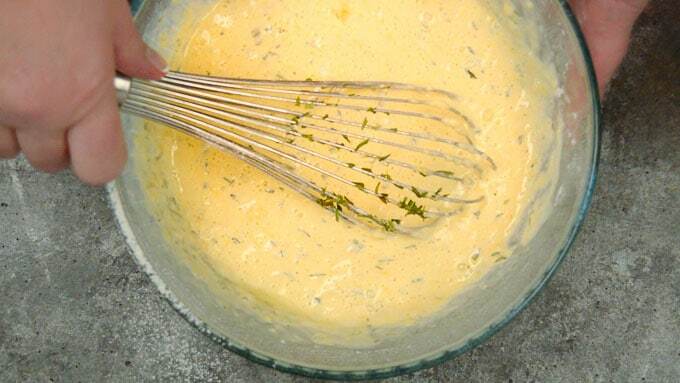 Using a whisk in a bowl, blend the eggs until nice and frothy. Add half and half and stir to combine. Sift flour and salt into the eggs and blend well. Add herbs and pepper if you wish. Place in fridge for at least 30 mins up to 3 hours. 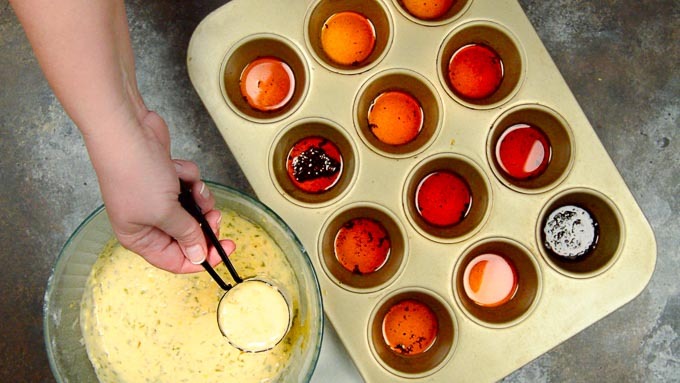 Take the pan drippings and place 1 tablespoon (generous) in the bottom of each muffin tin. Once oven is hot, place the pan with the drippings in for 5 minutes until the oil is just smoking. Remove the bowl with egg/flour mixture from fridge when you put the pan in the oven, stir to remix. Once oil is smoking you will add 1/4 -1/3 cup batter to each muffin tin. (the muffin tin cup should be filled to about 1/2-2/3 full--- no more than that or it will make a mess in your oven. 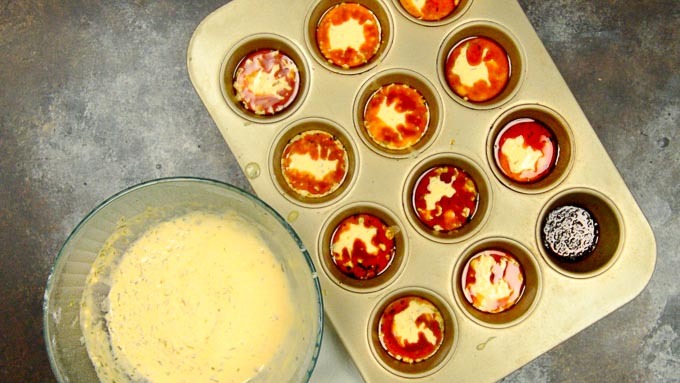 Carefully place the muffin tin in the oven and bake for 13-14 minutes until they have popped. You can carve the roast while they are baking. Serve immediately on top of prime rib or the meat you have roasted. Make the batter when you put the prime rib in the oven or at least 3o minutes before it will be coming out of the oven. Allow to rest in fridge in covered container until needed. Options: If you don't have any pan drippings you can substitute vegetable oil or any oil that has a high smoking point. Olive oil will NOT work, it smokes very easily and will burn the popover. This will be a sure hit for the holidays! Looks really delicious! I am addicted to popovers but have to admit I have only had them for breakfast. The thought of using the moist and crispy puddings to soak up the juices from that delicious prime rib makes it even more delicious! Perfect with prime rib for Christmas dinner. We like them right out of the pan! I love a good yorkshire pud. Brings back memories of Sunday dinners at my parents house! I have never eaten Yorkshire pudding! I have however made popovers — and know right from the start this recipe is happening in my kitchen! I’ve been wanting to try making yorkshire pudding! Your recipe looks so perfect! These look so puffed and delicious! I will be making them during the holiday season for sure! I really never knew how these were made. I always attributed the word pudding with something sweet. These sound amazing and a GREAT accompaniment to any special meal. I’m bookmarking this recipe so I can give it a try. Your instructions make it seem a lot less daunting! I love that you took the best from all of the recipes and combined it into one fantastic winner! So smart! This is going to become a holiday tradition!